Munitions (devices equipped with explosives or other material for use in military operations) can represent a hazard to people and to any future use of the land where they are located. As either the accidental or deliberate remnants of military activity, they represent a growing humanitarian and environmental problem in many parts of the world. There are two general categories of these munitions. The first, unexploded ordnance (often abbreviated "UXO") can be defined as munitions that are left in place due to either not detonating as intended, or by deliberate abandonment once military operations have ceased. The second, mines, are a type of unexploded ordnance that are deliberately hidden and which are meant to cause damage to people or property at a later time. Unexploded ordnance is generally considered less dangerous than a mine because it is often found on the surface of the ground, although in many instances, unexploded ordnance can be feet or meters beneath the surface. Unexploded ordnance poses a potential hazard wherever it is found. Adults may attempt to collect unexploded ordnance as souvenirs or for resale as scrap metal. Children are at greater risk than adults because they are often attracted by the unusual objects and are unaware of the danger. 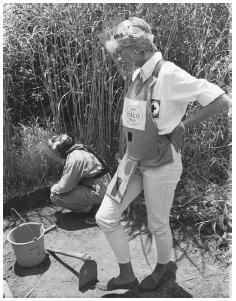 In an effort to raise world attention about the dangers of unexploded land mines, Diana, Princess of Wales, watches a land-mine clearing demonstration in Huambo, central Angola, in 1997.
first deployed in the Vietnam War, and represent a growing source of danger from unexploded ordnance as they are used in more areas of combat. When found on the sites of former ordnance supply depots, unexploded ordnance may be on the surface of the ground or just beneath the surface. At former bombing, artillery, or gunnery ranges, unexploded ordnance may be found at depths of several meters or feet if a projectile impacted the earth with considerable force and failed to detonate. The number of unexploded ordnance per acre depends on the size and intensity of use of a particular site. For example, the former Lowry Bombing Range in Colorado could have anywhere from 0.4 to 32 items of unexploded ordnance per acre, depending upon which organization is calculating the estimate (the smaller number comes from the U.S. Department of Defense, and the larger number is from the State of Colorado). On the other hand, the smaller but more intensively used former Southwest Proving Ground in Arkansas is estimated to contain 800 items of unexploded ordnance per acre. Unexploded ordnance clearance program. The United States has made a systematic effort to clean up unexploded ordnance at former ordnance supply depots and military ranges. As recently as 1999, it was estimated that as many as 2,657 former military sites needed to be cleared of unexploded ordnance in the U.S., and by 2002, that number was raised to 9,000. The Defense Environmental Restoration Program (for) Formerly Used Defense Sites gives the U.S. Army Corps of Engineers the task of environmental restoration (including the cleanup of unexploded ordnance) at all former defense sites, regardless of which branch of the service was originally responsible for operating the site. The Corps follows a program of investigation and restoration that is specific to the needs of each site. This may include clearance of unexploded ordnance at the surface or to a specified depth. The actual detection of unexploded ordnance uses many of the same techniques used in mine clearance (discussed below). At the end of the restoration activity, the site may be approved for unrestricted future use, or may have its possible future uses restricted so as to limit exposure of people to the site. Also, long-term monitoring of the site may be instituted to insure that any unexploded ordnance missed by the restoration activity is not brought to the surface by erosion or the freeze-thaw cycle. Mines, also called land mines, are a type of unexploded ordnance that will still function as originally intended. Usually carefully hidden in the shallow subsurface, they remain in place in order to explode in proximity to or in contact with a person or target. Because they can remain functional long after the end of the particular conflict in which they were deployed, mines create a lingering danger for anyone who comes near them. Originally developed for use in the American Civil War of the 1860s (where they were called torpedoes), mines from conflicts as long ago as World War I to as recent as the Balkan Wars of the 1990s are still causing injury today. Mines come in a variety of designs, and new types of mines are constantly being developed to fill either an antipersonnel (death or injury of people) or anti-material (destruction or damage of equipment) function. They may be hidden individually, or in large numbers as a minefield so as to deny a potential adversary (or the local indigenous population) the use of a particular area. It has been estimated that as many as 60 people a day are killed by antipersonnel mines. The United Nations has been involved in mine action (all aspects of mine education, detection, and removal) since it began working with the problem in Afghanistan in 1988. It acts primarily through the U.N. Department of Peacekeeping Operations, although eleven different departments or agencies within the U.N. are involved in some way with mine action. UNICEF (the United Nations Children's Fund) has been named the U. N. Focal Point for mine awareness education, and has published the U.N.'s International Guidelines for Landmine and Unexploded Ordnance Awareness Education. The International Committee of the Red Cross has its own mine/UXO awareness programs that inform and work with affected communities that have mine problems. Humanitarian mine clearance is the removal of mines or unexploded ordnance under the auspices of a private humanitarian organizations (sometimes referred to as Non-Governmental Organizations, or NGOs), so as to allow the land to be used by the local community. One recent source lists 16 different such private organizations that are directly involved with mine and unexploded ordnance eradication, and eight other private organizations that work with communities affected by mines and unexploded ordnance. Mine clearance (also called demining) has been described as consisting of two levels of activity. In the first level, which could be carried concurrently with a mine awareness program, an assessment is made of the scope of the problem through interviews and questionnaires given to the local population that is most directly affected by the presence of mines. The second level includes the location and removal of the mines. This may be done by a technique as simple as probing the ground with long sticks at regular intervals, exposing any solid objects that are encountered, and then removing any of the objects that turn out to be mines. Or, specially trained dogs may be employed to sniff out and indicate the location of explosives in the ground, followed by digging to reveal any mines and the subsequent removal of the mines. Sophisticated electronic or geophysical methods have become widely used in the detection of both mines and other unexploded ordnance, and are utilized by demining technicians carrying detection equipment over the area to be examined for mines. These methods include electro-magnetic induction (EMI), where an electrical current is induced and detected in buried metallic objects such as mine casings, and magnetometry that detects the distortions in the Earth's magnetic fields caused by buried ferrous objects. Conductive soils, interference from buried pipelines and artifacts, magnetic minerals, and plastic mine casings may cause difficulties in using these detection techniques. Ground penetrating radar (GPR) is not affected by these considerations, and instead reveals shapes of objects in the subsurface that might be mines. GPR is not considered to be as reliable as EMI or magnetometry, and the radar signal can be absorbed by vegetation or moisture in the soil. Newer technologies for use in mine detection include infrared (heat) imaging that detects the difference between how a buried mine and the surrounding soil retain or release heat. Vegetation interferes with this technique, and heat imaging can only detect mines within centimeters (inches) of the surface. Thermal neutron activation, already in use at some airports for detecting explosives in luggage, has also been proposed for the detection of explosives in buried mines. This would detect the high nitrogen content of explosives by bombarding the ground with neutrons and then looking for the specific gamma ray response of nitrogen. Problems with this technique include the need for a radioactive isotope as a source of gamma rays in the field. In most cases, physical removal of mines in an area is still undertaken manually by technicians in the field, which is slow, labor-intensive, and dangerous. There are many mechanical systems for use in automated demining, such as large flail machines and milling machines, and proposed devices utilizing jets of water or lasers, but these have been criticized for their cumbersome nature and expense, the need for extensive logistical support, and the need to manually recheck areas where the machines have operated. An international treaty to ban anti-personnel mines was signed by 122 nations in Ottawa, the capital of Canada, in December 1997. Formally entitled the Convention on the Prohibition of the Use, Stockpiling, Production and Transfer of Anti-personnel Mines and on Their Destruction, and less formally known as the Ottawa Convention, this treaty was ratified by 132 nations as of 2003. The United States is one of 62 nations that has not ratified the treaty. Bryden, A., and A. McAslan. Mine Action Equipment: Study of Global Operational Needs. Geneva, Switzerland: Geneva International Centre for Humanitarian Demining, 2002. Croll, M. The History of Landmines. Barnsley, South Yorkshire, Great Britain: Leo Cooper, 1998. King, Colin, ed. Jane's Mines and Mine Clearance. Coulsdon, Surrey, Great Britain: Jane's Information Group, 1998. McGrath, R. Landmines and Unexploded Ordnance: A Resource Book Sterling, Virginia: Pluto Press, 2000. United States Environmental Protection Agency. Interim Final Handbook on the Management of Ordnance and Explosives at Closed, Transferred, and Transferring Range. Washington, D. C.: U.S. EPA Office of Solid Waste and Emergency Response, 2002. Loeb, V. "Unexploded Arms Require Big Cleanup at 16,000 U.S. Sites." Washington Post. November 25, 2002. Sahlin, C., Jr. National Defense University Institute for National Strategic Studies, Washington, D.C. "Global Mine Clearance: An Achievable Goal?" Strategic Forum Number 43, 1998. Lambert, M. "Unexploded Ordnance: a Reference Guide for the Citizen." Environmental Science and Technology Briefs for Citizens. 2001. < http://www.engg.ksu.edu/HSRC/Tosc/uxo.pdf > (April 25, 2003). Canada Department of Foreign Affairs. "The Ottawa Convention Status Report." SAFELANE. April 2, 2003. < http://www.mines.gc.ca/convention-en.asp > (April 27, 2003). UNICEF. "International Guidelines for Landmine and Unexploded Ordnance Awareness Education." United Nations. 2002. < http://www.unicef.org/landguide/mineawar.pdf >(April 24, 2003).